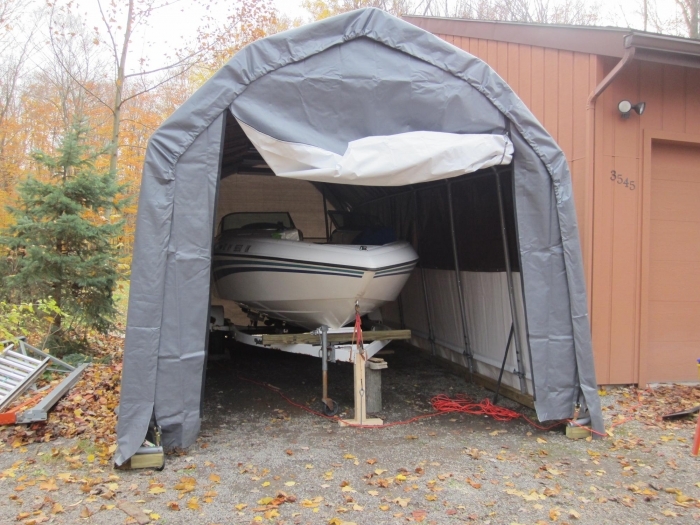 Enjoy the advantage of having an enclosed garage without the hassle of building a permanent structure or the high price tag that comes along with it by purchasing this 12 x 24 x 11 Barn Style Portable Garage Canopy. Rigorous weather conditions will not affect the portable garage as the frame features a sturdy beam welded 2 inch diameter 17 gauge steel frame. The powder-coat finish is bonded with DuPont to prevent rust, weathering, chipping and peeling. 100% waterproof and completely tear resistant, this garage is an excellent choice. Could the door be cut off without damaging the rest to allow entrance of my 10' (in the center) van RV? 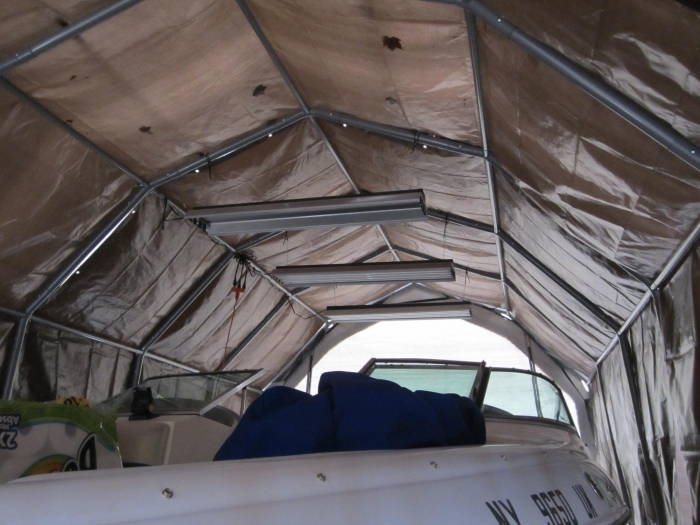 We would not be able to recommend that alteration, as performing it would void the manufacturer's warranty and could result in fraying to the cut edge, which might be difficult to stop once started. Do you have this in 28' long? Yes, please view our ShelterLogic 12 x 28 x 11 Barn Style Portable Garage Canopy located here. 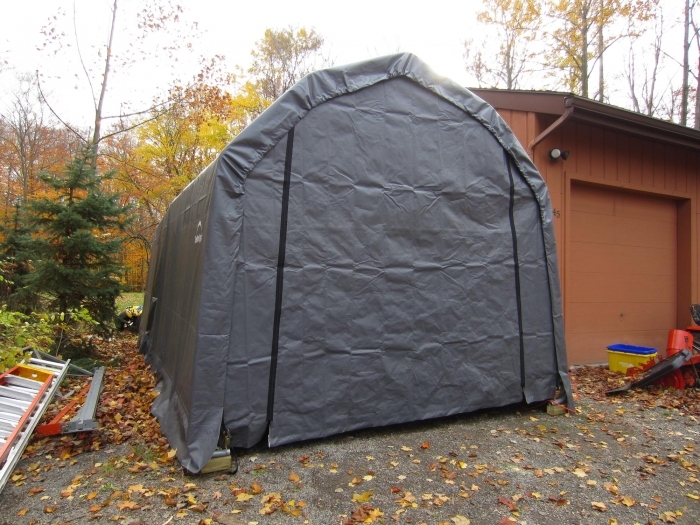 How high is the first bend on the side wall of this ShelterLogic 12 x 24 x 11 Barn style portable garage canopy? I need to know if I put it up next to the side of the building if it will clear the roof overhang. Thank you for your inquiry. 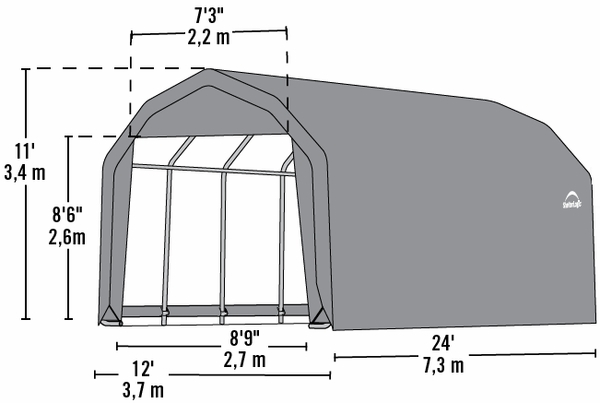 The ShelterLogic 12 x 24 x 11 Barn Style Portable Garage Canopy - Grey - 90153 is 8 feet 6 inches from the ground to the first bend on the sides. The overall height at the peak is 11 feet. Can this ShelterLogic 12 x 24 x 11 barn style portable garage canopy be setup on reasonably sloped ground, assuming that the spot is still otherwise flat? Is there a flap that comes down for a door? Thank you for your inquiry. 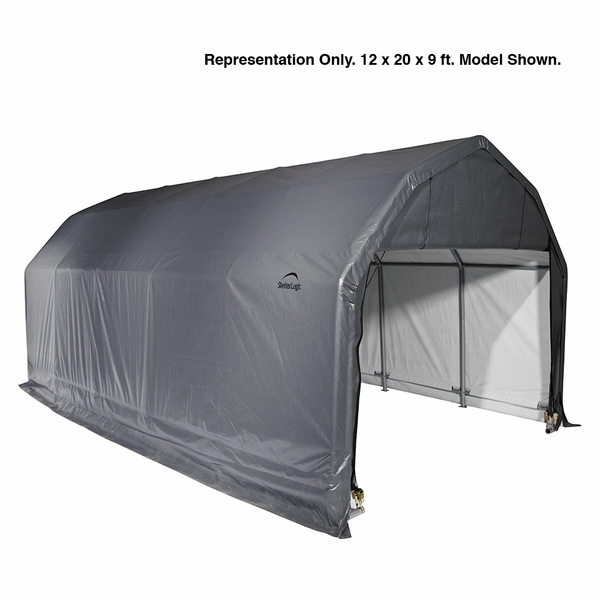 The ShelterLogic 12 x 24 x 11 Barn Style Portable Garage Canopy - Grey - 90153 has a (2) Double zippered door panels. The photo just shows the unit with the door rolled up. What is the height of the door opening of this ShelterLogic 12 x 24 x 11 barn style portable garage canopy? The height of the door opening is 8' 6". My boat has a wake board tower on it. What is the height of the doors at the corners of this ShelterLogic barn style garage canopy? Also, does the canvas in the center of the door come out? The height of the door is 8'-6" all the way across. I am looking for something that is 10-12 feet wide, 20-25 feet long, and 11+ high. I am looking for something with front and rear doors. Does this product have front and rear doors? By your measurements, it looks like you have found a shelter to fit your needs. This unit does come with 2 door kits. The doors are 9' in height. Indeed, this item features a one year warranty. Does this garage have a door on both sides? Can I drive through it? This item features two roll-up door kits allowing access from either end. When you say "all but the most rigorous weather conditions," what exactly do you mean? We live in northern Vermont, where it gets pretty cold and sometimes we get a wet, heavy snowfall. 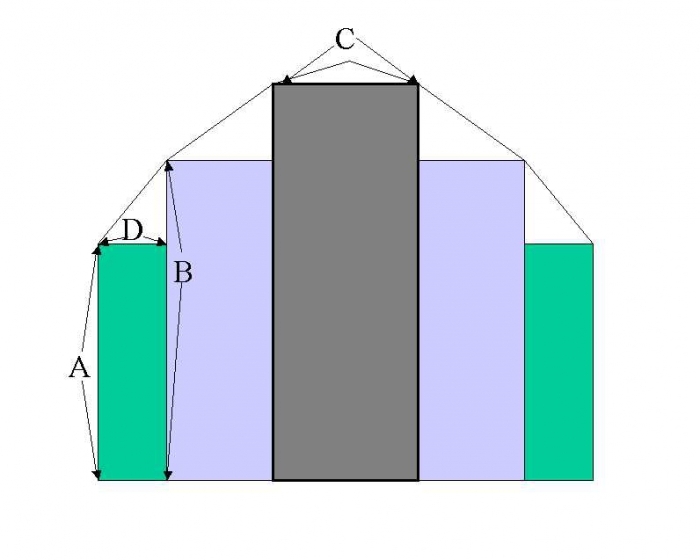 Can the structure withstand such conditions? You would need to keep the snow from building atop the unit.